This book is an indispensable how-to-guide on flourishing when studying abroad, and how to use an international education to begin a fulfilling career after graduation. 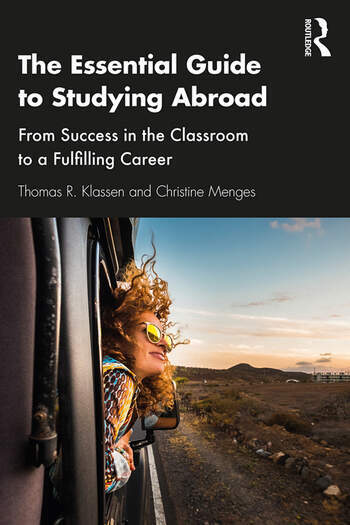 Written in an engaging and accessible style, using many examples, case studies and links to resources, the book reduces the stress of studying abroad. Covering all aspects of the international student experience – inside and outside the classroom – the book encourages young people to perform their very best and succeed in their new environment. International students preparing for cross cultural learning and recent graduates looking for employment will find this book both practical and inspiring. Thomas R. Klassen is a Professor at York University in Toronto, Canada. He has taught in a variety of programs, including the IMBA at the Schulich School of Business, the Department of Political Science, the School of Public Policy and Administration, and the Faculty of Health. He has taught university courses in South Korea (at Yonsei University) and Germany (at the University of Konstanz). He divides his time between Toronto, Canada and Seoul, South Korea. Christine Menges is Director of the Career Center, MBA Programs, at the WHU-Otto Beisheim School of Management, one of Germany’s top business schools according to major national and international rankings. She has crafted WHU’s career counseling approach and placement strategy for students with work experience and forges networks with industry leaders. She holds a PhD in management with a special focus on mentoring, from the University of St. Gallen in Switzerland. 'As a university professor who has both studied and taught in several different countries, I strongly recommend A Guide to Studying Abroad, which does exactly what its title promises. Clearly written and accessible, the book features precious insight on how to apply successfully to international programs, adjust to life in a foreign land, ace tests and exams and, finally, on how to get ready for the job market and prepare a winning resume. 'With advice for every step of the way, from considering studying abroad through to completion and next steps, this book provides useful insights and signposts to resources that will aid students to make the most of their international adventure. It is easy to dip in and out of the chapters which cover topics relevant to both prospective and current international students.